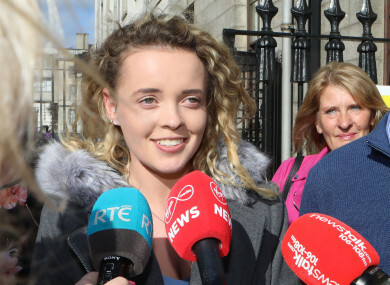 Rebecca Carter had sued the Commission challenging its decision not to re-check her points score in time to allow her to obtain a place at UCD. WEXFORD STUDENT REBECCA Carter, whose Leaving Cert exam points were wrongly totted up by State Examinations Commission markers, has achieved her dream of winning a place in veterinary medicine at UCD. Justice Richard Humphreys told a smiling Rebecca in the High Court today that had her points been correctly added up she would have achieved an extremely high mark that would easily have qualified her for a place at the UCD course. Rebecca (18) of Ardcolm Drive, Rectory Hall, Castlebridge, Wexford, had sued the Commission challenging its decision not to re-check her points score in time to allow her to obtain a place at UCD. She had spent four days in the High Court listening to legal teams present evidence and argue legal points with regard to her case and today hugged family and friends in the courtroom after hearing the judge ruled in her favour. Judge Humphreys told Micheal P O’Higgins SC, who appeared with barrister Brendan Hennessy for Rebecca, that he would direct the Commission to carry out the necessary corrections to her exam paper by noon on Friday and notify UCD two hours later of the result. The Central Applications Office, which processes applications for undergraduate courses in colleges, would inform Carter by 5pm Friday of its decision to award her a placement. Judge Humphreys said the situation faced by Carter had been highly unfair and described the process engaged in by the Commission as manifestly unfit for purpose, and a situation which should not repeat itself next year. He said the delay in dealing with her request for a recount had caused her distress. Conor Power SC, who appeared with Aoife Carroll for the Commission, asked the court to consider a stay on its decision but Judge Humphreys said that to grant a stay would nullify his decision and allow Carter no benefit from her successful legal challenge. Following the decision, Rebecca hugged her mum Anne Marie and her father Niall and said she was delighted with the outcome. Her mother said she was absolutely delighted “for Becky” who, she said had always wanted to be a vet. Judge Humphreys had initially been told that UCD had agreed to reserve Rebecca’s potential placing until 30 September. The court heard that Rebecca had repeated her leaving certificate exams and had received 554 points, just six short of the required number for veterinary medicine at UCD. The points required for the course had dropped to 555 in the second round offer which had left her only a point short. O’Higgins, who was instructed by Dublin solicitor Eileen McCabe, said Rebecca had not been satisfied that the result fairly reflected her exam performance and took part in a review in the presence of two teachers. It had been discovered that her points total had been wrongly totted up and had the error not have occurred she would have surpassed the level required for the veterinary course. Judge Humphreys said that one important factor in reaching his decision was that had the exam paper been correctly marked Rebecca would have had a prima facie case in winning a place at UCD. He said he would hand down a written judgment later and adjourned the proceedings for mention on Tuesday afternoon. Rebecca is a full cousin of Wexford’s fake tan magnate Marissa Carter, head of her Cocoa Brown cosmetics business. Email “Student whose Leaving Cert results were wrongly totted up wins her case in the High Court”. Feedback on “Student whose Leaving Cert results were wrongly totted up wins her case in the High Court”.